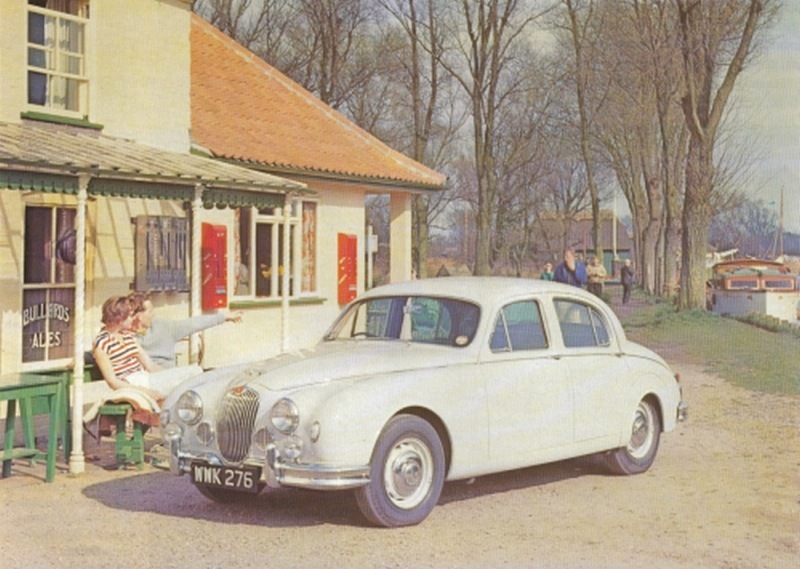 THE compact Jaguar saloons of the 1950s and 1960s will forever be associated, in the minds of Britons of a certain age at least, with the late actor John Thaw. In the 1970s Britcop series The Sweeney, Thaw in the guise of Jack Regan, usually ended up chasing a dilapidated Jag from a Euston Films job lot, driven by the villain of the piece into automotive oblivion, his Ford-supplied Consul/Granada emerging triumphant. By the late 1980s Thaw was now playing the Jaguar driving Inspector Morse, who was seen in a 240 with a non-standard vinyl roof and had the door rubbers removed to aid filming. But back to the beginning. As all the Jaguar histories tell you, in 1948 the company announced the six-cylinder twin overhead camshaft XK engine, a radical production unit at a time when many cars relied on side valve engines for their motive power. The XK engine was gradually phased into Jaguar’s range, supplanting the Standard Motors designed 2.5- and 3.5-litre units for which Jaguar now held the tooling. Also being phased out was the four-cylinder 1.5-litre engine which Jaguar still bought from Standard, and had powered the most popular SS/Jaguar models. The 1.5-litre was withdrawn from sale in 1949, but despite the move upmarket, Jaguar sales boomed with the 3.5-litre MkV saloon easily outselling the XK120 sports car and 2.5-litre saloon in 1949 and 1950. 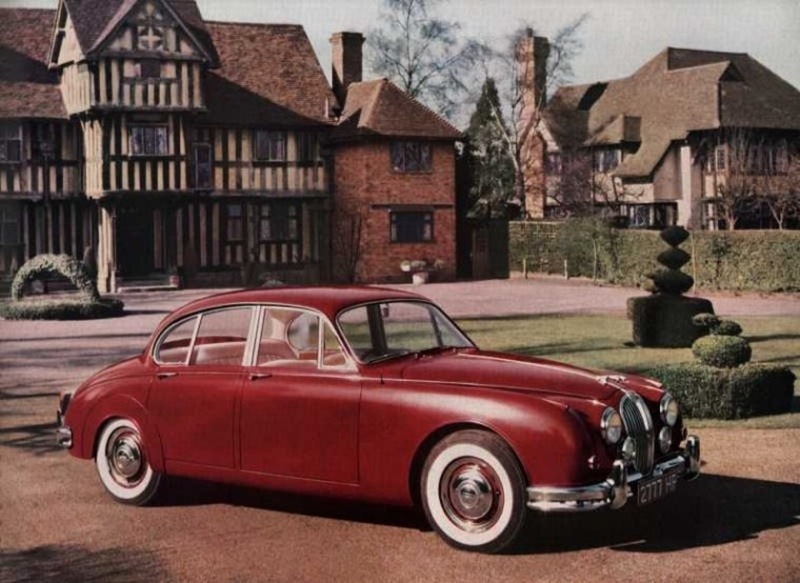 At the end of 1950 the Mk VII saloon was announced with the 3.4-litre XK engine, thus completing the phasing out of the previous generation of power units. Saleswise the smaller engined Jaguars were not missed, but senior Jaguar management was conscious that in an economic downturn the company would be vulnerable, as sales of expensive, big engined cars would be the first to suffer, and therefore felt that it needed to broaden the company’s range to ensure financial security. During 1952 Jaguar completed its move from Swallow Road to Browns Lane in Coventry, which is where project Utah, as the new Jaguar programme was known, began its life. Three things were clear from the outset, it would be a saloon, have unitary construction and have an engine of around 2.5-litres. As saloons comfortably outsold roadsters, the decision to opt for a tin top was not hard to make. The Motor industry was in general opting for unitary construction over that of using a separate chassis and body. The theoretical advantages of unitary construction was that cars could be made both lighter and lower and at a greater rate. Pressed Steel made the panels for the separate chassis Jaguar’s anyway, so it would be easier for Jaguar to hand over responsibility for body production for project Utah to them. The only daunting thing facing Jaguar was the cost of the unitary method. To make Utah economic, Pressed Steel would, according to writer Jeff Daniels, have to produce 10,000 bodies a year. 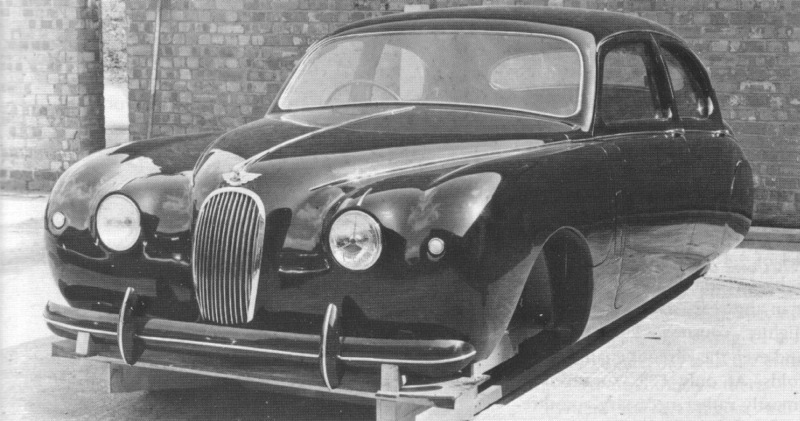 These were the early days of unitary construction and as Jaguar Chief Body Engineer Bill Thornton and his assistant Cyril Crouch worked with Pressed Steel, sometimes compromises had to be made. Styling, which was of course done by Jaguar boss William Lyons, had to blend in with the need to add strength, which in turn added weight, to the bodyshell. Another disadvantage with the unitary method compared with that of the separate chassis was that of noise, vibration and harshness (NVH). 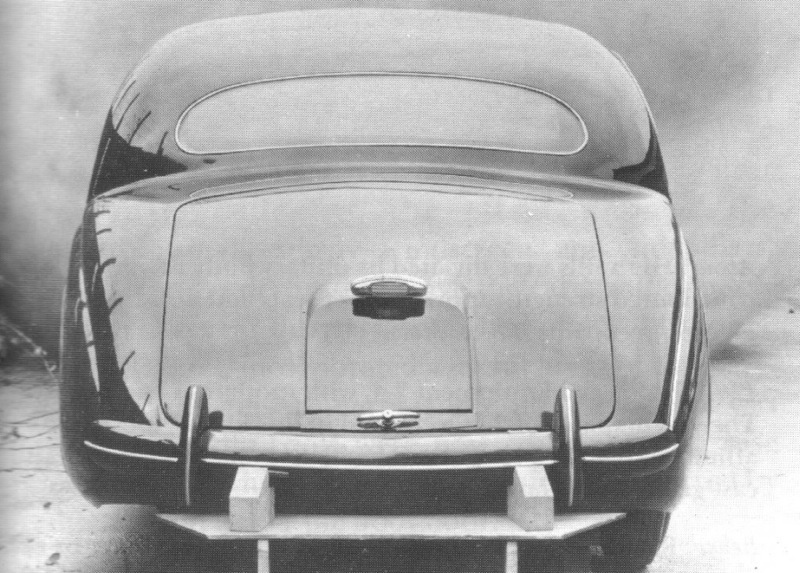 The unitary body tended to act as an echo chamber and amplify noises transmitted through the suspension. Dealing with NVH then was an unknown science, luckily Jaguar assigned engineer Bob Knight to the case, a man who was to become the worlds leading authority on the subject in his subsequent work for for the company. Utah ended up with a wheelbase of 107.4in, a length of 181in, 67in wide and a height of 57.5in. In reality, the resulting car was not all that smaller than the MkVII saloon. However, with a kerb weight of 2800lb, the unitary construction body was lighter than the 3864lb Mk VII. Jaguar had a sporting image, this was after all the companies Le Mans glory years era, and it was important that Utah’s 2.5-litre engine could propel it to 100mph. But what engine would it use? Jaguar, under Technical Director William Heynes, had two choices. It could use a 2-litre, four-cylinder XK engine or modify the existing six-cylinder unit. Jaguar had worked on a four-cylinder XK engine right up until November 1953, a 1970cc unit with an 83mm bore and 91mm stroke, producing anything from 95bhp to 105bhp at 6000rpm. What did for the four-cylinder XK was a combination of marketing and technical issues. It was felt that using a four-cylinder engine would take Jaguar to far downmarket, and once it was realised what form Utah’s bodyshell would take, it was realised that the 2-litre XK four lacked the grunt to give the car the required performance. Therefore Jaguar turned towards the option of modifying the existing XK six-cylinder. In fact it was working on this option simultaneously with the four-cylinder variant. On 25 August 1952 Jaguar tested a 3.4-litre block fitted with a shorter stroke 77mm crankshaft to produce a 2499.69cc engine. This test cycle lasted until 11 December 1953. However on 26 August 1953 Jaguar tested a new engine, retaining the standard XK bore of 83mm with a new stroke of 76.5mm to create an engine of 2483cc. This new variant clearly won through as testing on the alternative engines ceased at the end of 1953. The production 2483cc XK engine would use a shorter block than the 3.4-litre version and used Solex instead of SU carburettors to produce 112bhp at 5750rpm and torque of 140lb ft at 2000rpm. The transmission was a Moss manual four-speed gearbox with Laycock de Normanville overdrive available as an extra. The front suspension was the work of William Heynes, used coil springs mounted to a separate subframe in an effort to reduce NVH. For the rear suspension Heynes opted for a layout using cantilevered semi elliptic leaf springs and plenty of rubber, again to reduce NVH. The steering was by Burman and Lockheed supplied the all round drum brakes. The external styling by William Lyons took its cues from the XK sports car range. The interior was the usual walnut and leather that buyers of this type of car expected with a huge if old fashioned looking steering wheel. By September 1954 Jaguar had two prototype Utahs running and an off tools prototype was completed on 7 January 1955. Jaguar Mk1 launches at Earls Court in 1955. The Utah was finally unveiled to the public at the 1955 Earls Court Motor Show on 19 October, where it now went under the official name of the Jaguar 2.4-litre. The car retailed in two forms, Standard and Special Equipment. The cheaper £1269 Standard model lacked the heater, tachometer, folding centre armrest in the rear, screen washers, twin fog lamps, cigar lighter, courtesy switches for the interior rear lighting found on the £1298 Special Equipment model. However most buyers were prepared to spend the extra £29 for the Special Equipment version. Despite the Earls Court unveiling, the reality was that only 32 Jaguar 2.4-litres were built in 1955 and most of those were probably retained by the factory for development and PR work. It would not be until the summer of 1956 before the press got their hands on the 2.4-litre to evaluate and one has to take their comments with a pinch of salt bearing in mind that the Browns Lane PR department was a dab hand at supplying specially prepared cars to the gentlemen of the press. The Motor magazine test car, SWK 803 an overdrive Special Equipment car, certainly achieved the performance targets set for Utah, with a top speed of 101.5mph, 0-60mph time of 14.4 seconds and fuel economy of 24.4mpg. Autocar tested SWK 986, again an overdrive Special Equipment car, and attained a terminal velocity of 102.5mph, a 0-60mph time of 15.8 seconds and burned fuel at a rate of 23.1mpg. The Jaguar 2.4 had relatively few teething troubles upon introduction and 8029 were manufactured during 1956. Also that year, for those who wanted more grunt, the company offered three tuning kits, increasing power to 119bhp, 131bhp and 150bhp respectively. The factory was in fact planning a major power boost to the Utah design by installing the taller 3442cc XK engine seen in the other Jaguar models. One of the reasons cited for this was that the 2.4-litre was seen as underpowered in the important American market. Installing the 3.4-litre engine into the Utah bodyshell was not that simple. The bigger engine needed an improved cooling system so a larger radiator had to be installed and to feed air into that required a larger grille which then resulted in the front wings being modified. As the 3.4-litre engine was heavier than the 2.4, the front suspension had to be beefed up with stronger coil springs. The rear axle then had to be strengthened to cope with the increased torque provided by the larger engine. Unfortunately the brakes were still of the drum variety, but new fangled disc brakes were on there way. Also new was the option of automatic transmission, a popular choice in the US market. Jaguar chose the three-speed Borg Warner type DG, an American design now being made at their UK factory at Letchworth in Hertfordshire. Jaguar was in the process of building up stocks of the new 3.4-litre Utah, with priority given to export markets, when on 12 February 1957 fire swept through the Browns Lane plant, destroying many cars, including some the new models. Superhuman efforts by the workforce and contractors enabled limited production to restart after nine days, but it was six weeks before production was back to normal. So how did the up-gunned 3.4-litre Jaguar, with its 210bhp at 5500rpm, torque of 216lb ft at 3000rpm and twin SU carburettors, perform? Motor magazine was the first British magazine to test a car, TRW 316 in April 1957, a left hand drive car with automatic transmission. With initial production aimed at export markets, this was all Jaguar could offer the publication. However TRW 316 was no slouch with a 0-60mph time of 11.2 seconds and a top speed of 119.8mph, although fuel consumption was 19.2mpg. In fact the new saloon was as fast as the XK140 sports car. Motor hailed the car for its performance and refinement, but slammed it for its braking ability, resulting in heated discussions with the factory, but this did hasten the fitment of disc brakes, originally as an option, in the autumn when the car also went on sale in the UK. The rival Autocar magazine did not get hold of a 3.4-litre Jaguar until June 1958 when it tested VRW 974, a manual car with overdrive. Top speed was 120mph, fuel consumption 16mpg while the 0-60mph dash was achieved in a mere 9.1 seconds and all this was achieved with no loss of refinement. This was seriously impressive performance for the time, the Jaguar 3.4 outpacing more expensive rivals with ease. Not only was Jaguar fast on the track, it had genuine pace on the public highway as well. In 1957 Jaguar produced 8520 Utah saloons followed in 1958 by a further 11,605. Over the next two years there were numerous changes to Utah. In September 1957 the larger 3.4 grille and wings were standardized across the range. Then in November that year, automatic transmission became available on the 2.4-litre. Although the disc brake option was available and was in fact specified so often as to become virtually standard, drum braked Utahs were available until January 1959. In January 1958 Jaguar introduced a disc brake conversion kit that could be fitted retrospectively to Utah models. Disc brakes eventually became standard in January 1959. The days of the original compact Jaguar were however numbered as in the summer of 1958 the company began to develop a revised model called Utah facelift or Utah Mk2. The aim was to improve areas such as heating and ventilation, poor driving visibility, an interior that was perceived as being old fashioned, high speed handling and modernise the exterior. Sir William Lyons revised the styling particularly around the rear window pillars. This and other styling touches such as a new front grille transformed the look of the car at minimal cost to Jaguar. 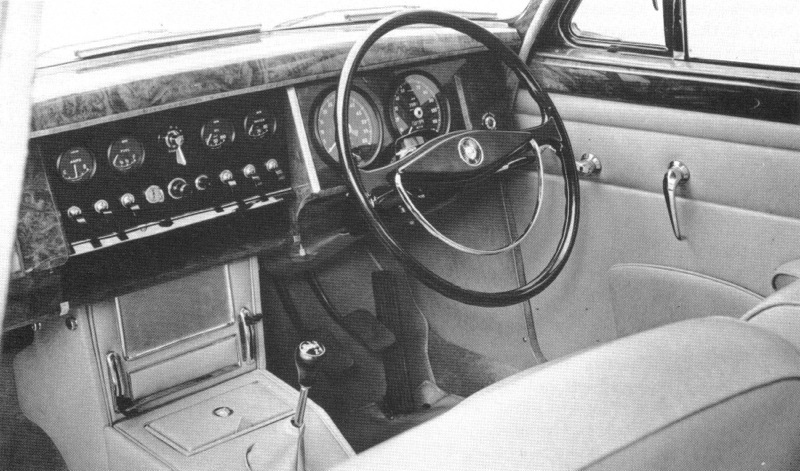 The interior was revised with a new seats, walnut dashboard and a more modern black steering wheel. Mechanically the major change was to fit a wider track rear axle, which improved high speed handling. Burman power steering was developed for the car as an optional extra. Unfortunately these revisions to Utah added some 112 to 167lb to the car’s weight. To compensate Jaguar fitted the B-type cylinder head to the 2.4-litre, boosting power to 120bhp at 5750rpm and torque to 144 at 2000rpm. The 3.4-litre was retained in its existing form, while a new version of the XK engine was added to the mix. The 3781cc XK engine, which had first appeared in the XK150 sports car announced in 1958, was a bored out version of the 3.4 unit. With peak power of 220bhp at 5500rpm and torque of 240lb ft at 3000rpm, this twin carburettor unit provided so must extra torque that it was decided to fit a Powr-Lok limited slip differential to the Utah Mk2 as standard. Early prototypes were simply modified Utahs. Indeed the prototype 3.8 Mk2 was registered TVC 420 and its engine was fitted as late as 4 June 1959. In July a 3.4-litre mule was fitted with experimental Lucas fuel injection. Off tools prototypes were built in August, September, and October in preparation for volume production. The Utah facelift was announced as the Mk2 Jaguar on 2 October 1959. From now on both the company and enthusiasts would refer to the outgoing model as the Mk1, and we will follow suit. Indeed the Mk2 would not be available until November/December 1959, so run out stocks of the Mk1, now only available in Special Equipment guise would tide the Jaguar dealers over until the new model was available. Autocar was the first to publish a road test of a Mk2, a 3.8 manual with overdrive, the model everyone wanted to drive. Its road test, published in February 1960 was by and large positive although there was some criticism of the seats. Performance was as expected, blistering. Top speed was 125mph, 0-60mph was reached in 8.5 seconds and fuel consumption was 15.7mpg. And all this was in a car that offered refinement and space for four people. The automatic transmission version was not tested until April 1963, again by Autocar. The three-speed box restricted top speed to 120.4mph, 0-60mph in 9.8 seconds although fuel consumption was better at 17.2mpg. The only Mk2 3.4-litre that the UK press tested was an automatic. Motor in August 1961 attained 119.9mph, 0.60mph in 11.9 seconds and fuel consumption of 16mpg, which on the face of it was little different to the automatic 3.8-litre. So how did the 2.4 litre Mk2 perform? Well it appears that Jaguar, who prided themselves on manufacturing 100mph plus cars, declined to loan the gentlemen of the press an example to road test It was not until March 1965 that Autocar got hold of a 2.4-litre Mk2 for a used car test. Using a run in 26,000 mile manual with overdrive car, the publication managed 96.4mph and a 0-60mph time of 17.3 seconds. Apparently the factory had not been able to achieve more than 98mph. For the moment Jaguar kept a lid on this embarrassing situation, but competition both internal and external would soon cause problems. On 26 May 1960 it was announced Jaguar Cars, Ltd., had arranged to buy for cash the Daimler Company from the Birmingham Small Arms group. It was intended to continue production of the current range of Daimler vehicles, but the Daimler factory at Radford, Coventry, which had more than a million square feet of floor space, would also provide the facilities needed for expanding Jaguar’s own output. Jaguar had wanted to expand and had been refused planning permission. It was now getting a large factory – the same size as Browns Lane – within a five minute journey. Events now moved fast. 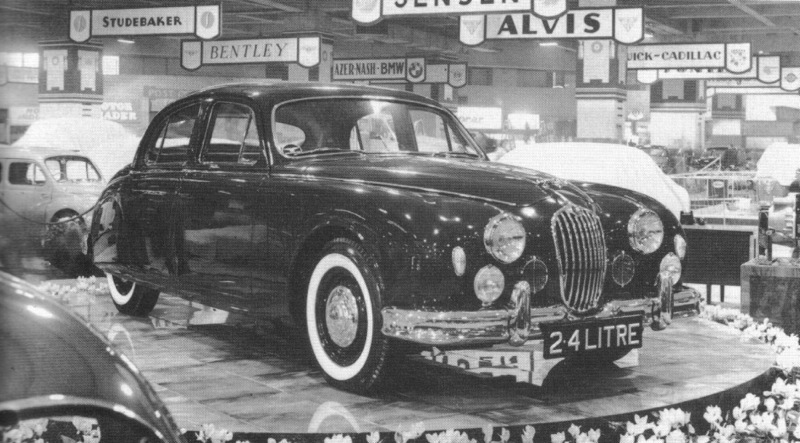 Having bought out Coventry rival, Daimler, another of Jaguar’s local competitors, Armstrong Siddeley announced on 9 June 1960 that it was ceasing car production. On 18 June 1960 the Jaguar Cars purchase of Daimler was formally ratified. The deal cost Jaguar £3.4 million. The plan was to transfer XK engine production to Radford to free up more space for production at Browns Lane. These expansion plans were outlined to the press on 27 October 1960. Jaguar may have inherited a fading range of cars from Daimler and intended to turn the Radford plant over to XK engine production, but not everything Daimler produced was inferior to the Browns Lane product. Only the previous year Daimler had introduced a 2548cc overhead valve V8. Using a single central camshaft operating the valves through pushrods, the engine was designed by Edward Turner who earlier in his career had designed Motorcycle engines. Design began in October 1956 and prototype engines were running eight months later. The V8 was designed to go in two cars, the DN250 saloon and the SP250 sports car. The DN250 was cancelled in mid 1959 and the SP250 was announced in April that year followed in October by the DP250, a prototype sports saloon based on the SP250 chassis and running gear. After the Jaguar buy out the DP250 project quickly bit the dust. However Jaguar engineers found the Daimler V8 engine was a thoroughly well designed and sound unit and the idea quickly dawned on senior management that here was the opportunity to create the sports saloon Daimler had been striving for by transplanting the V8 into the Mk2 body. By November 1960 project ZX530/112 under the leadership of Phil Weaver was underway. A Mk1 hack car received a Daimler V8 transplant and soon impressed with its better than expected performance. Soon a Mk2 was fitted with the V8 and a Borg Warner type 35 automatic transmission. The two test cars over next 16 months were used to iron out the bugs. 1960 Was a good year for the Mk2, with 17,535 produced. Turner V8 transformed the sporting Jaguar into a effortless Daimler. On 15 March 1961 the Jaguar E-type was announced and its looks and performance caused a sensation. The new sports car became the public image of Jaguar Cars in the 1960s, but in commercial terms the saloon range was the firms main breadwinner. In September and October 1961 Jaguar Mk2 production was restricted by a long strike at the SU Carburettors factory at Erdington in Birmingham. On 10 October it was announced that Jaguar was diversifying into commercial vehicles when it took over Guy Motors of Wolverhampton. Two days later the MkX top of the range Jaguar saloon was announced, though it would not be a big seller in its nine year production run. Even more Mk2s were built in 1961, 21,236, which was in fact the model’s peak year. In 1962 Jaguar was dogged with unofficial strikes as it struggled to meet a large American order. In February the main board was told of the intention to produce ZX530/112, which was announced on 8 October 1962 as the Daimler 2.5-litre V8. Jaguar had Daimler-ised the Mk2 body, the most obvious difference being the fluted radiator grille. Inside the main change was the fitment of a split bench front seat which allowed a passenger to be carried in the middle. Discreet Daimler ‘D’ badges were applied all over the car. Until 1967 only automatic transmission was available. On launch the Daimler V8 was priced between the Jaguar Mk2 2.4 and 3.4-litre, suggesting that the Daimler brand was more upmarket than Jaguar, but deferred to the more sporting image of the bigger engined cars. What the Daimler buyer got was a 2.5-litre engine which produced 140bhp at 5800rpm and torque of 155lb ft at 3600rpm, superior to the 2.4-litre XK engine. This was mated to the Borg Warner type 35 three-speed automatic transmission which was shorter than the type DG and would not be fitted to the Mk2 until June 1965. So how did it compare with the manual 2.4 Mk1 and Mk2? However the Daimler was never exported to the USA. Senior Jaguar engineers were always dismissive of the V8 engine format, arguing that it lacked the refinement of six- and 12-cylinder engines. The Edward Turner V8s, for there was also a larger 4.5-litre unit, proved them wrong, but the men at Brown Lane were to blindly plough their own expensive furrow in the pursuit of engineering excellence, culminating in the superb but thirsty and therefore sales deterring V12 of 1971. Even allowing for the disruption of production, Mk2 production slumped in 1962 at 12,743 plus a mere eight Daimler 2.5-litre V8s. There was further expansion to the Jaguar empire on 6 March 1963 when it was announced it was acquiring Coventry Climax, the fork lift truck and racing car engine manufacturer. This brought former XK engine co-designer Walter Hassan back into the Jaguar fold. By May 1963, Sir William Lyons was already in abortive talks to buy Colin Chapman’s Lotus concern. In an effort to maintain continuity of production, on 5 June 1963 Jaguar announced the appointment of a shop floor worker to an executive role. The man, who was chairman of the joint shop stewards committee, was Mr Harry Adey, aged 36, metal finisher, and he was appointed industrial relations manager. In announcing the appointment, the company give continued expansion as the reason. The post was a new one for Jaguar. Mr Adey was a member of one of the smaller unions at the firm, the Birmingham, Sheet Metal Workers’ Society. He soon had his work cut out dealing with his former workmates when 200 sheet metal workers struck. In July Jaguar Cars purchased the 150,000 sq ft Paget works adjacent to the Guy Motors works in Wolverhampton for £129,250. dealt with in a separate development story. The Mk2 was now facing increasing competition in the American market from the first generation of muscle cars with their large capacity V8 engines. Jaguar produced 12,697 Mk2/Daimlers in 1963, with the Daimler making up 19.24% of that figure. Now a threat to the smaller capacity Mk2s would emerge in the domestic market. On 9 October 1963 the Rover company, previously manufacturers of staid and technically unadventurous cars, announced the advanced P6 2000. Only six days later Standard-Triumph announced the Triumph 2000. Both these vehicles were aimed at the executive car market, were cutting edge in engineering and had more modernistic styling than the Jaguar Mk2 that was now ageing fast. What is more, both these compact executives could top 100mph, something the 2.4 Mk2 could not do. Soon both Rover and Triumph were working flat out to meet demand while Mk2 sales continued to slump. Even Sir William Lyons was impressed by the Triumph 2000. On 6 November he wrote to Sir Henry Spurrier, former Chairman of the Leyland group. ‘I think the new Triumph 2000 is going to be a winner. I had a good look at it at the (Motor) Show and was very impressed. At its price I think it has the edge on its competitors.’ In February 1964 Harry Mundy, designer of the Lotus Ford twin cam engine, joined Jaguar from Autocar magazine as the company strengthened its engineering team. In May the company endured a nine day strike over the mobility of labour. In November there was a further halt to production when supplies of rear axles dried up due to a strike at Salisbury Transmissions Ltd. The following month talks to buy Lotus were broken off. So 1964 ended, a year when 12,043 Mk2/Daimlers were built. 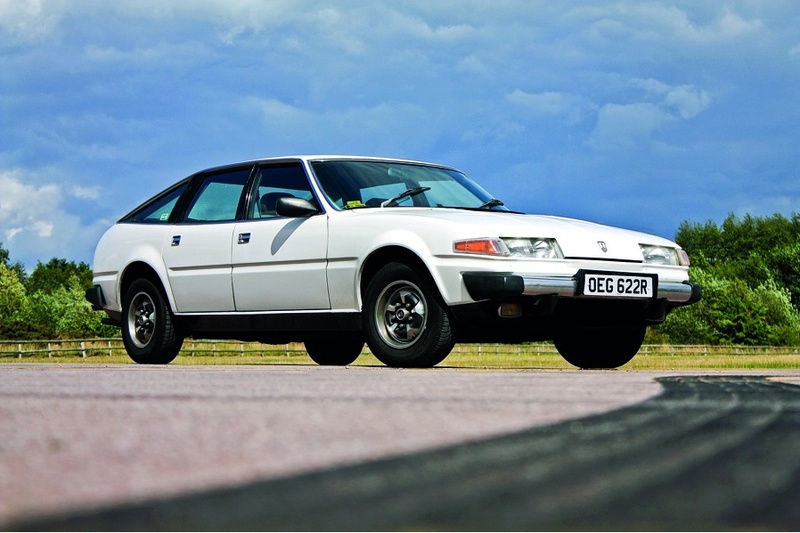 Jaguar was probably helped by the never ending series of strikes that Rover endured that year as it tried to ramp up P6 production, and production of the more sophisticated S-type was 7032, showing that the company was reclaiming some ground at the higher end of the market. On 1 January 1965 it was revealed that Jaguar had acquired Henry Meadows of Wolverhampton, producers of a wide variety of diesel engines, and, more recently, light engineering goods. The Coventry company planned to use the new acquisition to augment the manufacturing facilities for the Jaguar-Cummins diesel engine project, details of which had been announced shortly before. Their 60 fellow polishers stopped work — 2500 men were soon idle. The dispute was not resolved until 2 July after £3 to £4 million in production had been lost. Later that month it was revealed that the British Motor Corporation was buying Pressed Steel, Jaguar’s body supplier. By September the deal was finalised, the same month as the Mk2’s Moss manual gearbox was super ceded in production by Jaguar’s own design which had already been fitted to the E-type, MkX and S-type. Also in 1965 Jaguar had got down to some serious work on the XJ4 project, a saloon that would replace all the firms existing model in one go. That year Jaguar produced 8277 Mk2/Daimlers while S-type manufacture peaked at 9741. On 3 February 1966 Sir William Lyons outlined the problems confronting Jaguar in 1965. Strikes the previous year, he said, had cost the company £5 million in turnover and his workers lost £600,000 in wages. Bitterly, Sir William said that the year’s production would have been an all-time record ‘by a considerable margin.’ The wildcat strike in June lasting five weeks and unofficial stoppages at suppliers had a considerable effect on profits. In financial terms, the £18,200,000 deal was a take-over of Sir William Lyons’ Coventry company by Sir George Harriman’s Longbridge giant, the result of which was a new group, comprising Jaguar, BMC and Pressed Steel-Fisher, later christened British Motor Holdings. The long accepted reason for the merger is that the ageing Lyons, without a son and heir (his only son John had been killed in a car accident in May 1955) wished to secure the future of his company. Another reason was that Lyons needed some £8 million to finance the XJ4 project. Jaguar historians in the past could be accused of sycophancy, unable to see the faults in Lyons business plan which saw him use Jaguar’s spare capital to buy up other concerns instead of re-investing in the core luxury car business. Now he needed the capital for the XJ4, the only way to get it was to sell the company to a larger concern. Another aspect ignored by Jaguar historians was that the company was simply not making enough cars and money despite all the acclaim poured on its models by mainly British journalists. In 1959 Jaguar manufactured 20,876 cars, in 1961 the best year of Mk2 production and with engine assembly moved to Radford, production reached 24,018. With Radford on stream, Jaguar had the capacity to manufacture 50,000 cars a year. In 1962 the company actually produced less at 22,030 cars, followed by an improvement to 24,989 in 1963, 24,348 in 1964, 24,601 in 1965 and 25,936 in 1966. If the demand for the product was there the company could surely have produced more by laying on a night shift? By 1966 Jaguar seemed to have reached a plateau in its fortunes, seemingly unable to progress further and join the big boys in the luxury car sector. Possibly a reason for this is was the companies reputation for quality or lack of it in the important American market where it faced tough competition from the domestic auto industry and from rival continental importers. Jaguar owners became used to unreliability from ill fitting components that lacked durability and overheating XK engines in hot weather. 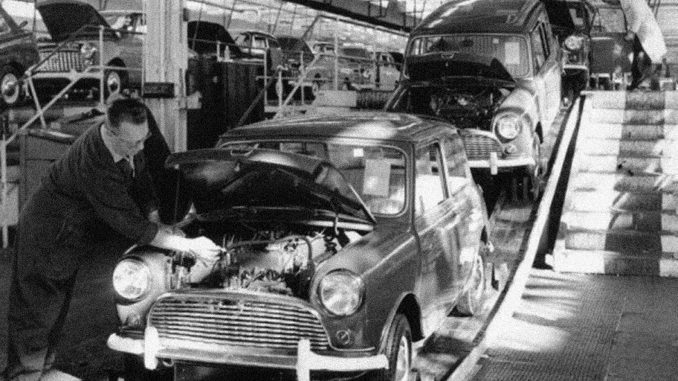 The cars were assembled in the Browns Lane plant by a disgruntled workforce that had little affection for their boss, as even Sir William Lyons official biographers admit. In September 1966, a slump in demand forced Jaguar to go on to a four day week, again suggesting that customers were not queuing up to buy their cars . In contrast Rover at Solihull was still working flat out producing the P6. Full time working at Jaguar would not be resumed until March 1967. About the same time the company introduced a number of economy measures on the Mk2 to reduce the cost of manufacture such as substituting Ambla vinyl for leather upholstery, although the measures were not widely publicised. On 13 October 1966 Jaguar announced the 420 and 420G models. The 420G was a revised Mk 10 while the 420 was a restyled S-type with the quad headlamp look and an addition to the Jaguar range, designed to tide the company over until the delayed XJ4 came on stream. 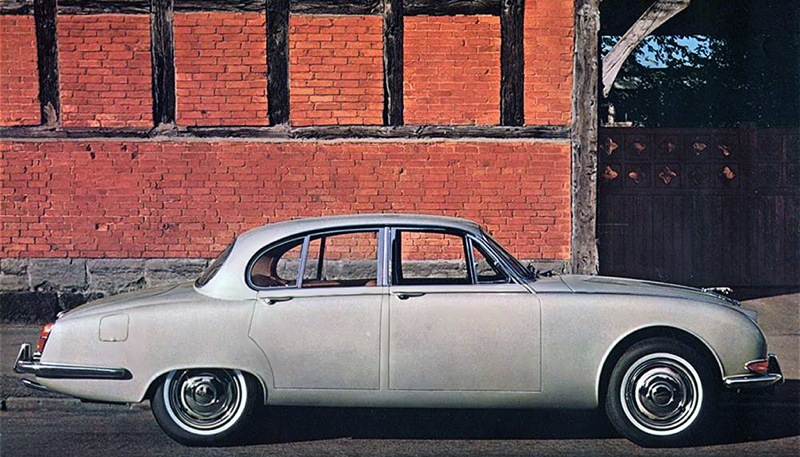 1966 Saw Daimler/Mk2 production slump badly to 5935, as indeed did all Jaguar saloon production, at a mere 15,990. Utah range is further updated to become the 240 and 340 series. In February 1967 the Daimler 2.5-litre V8 became available with manual transmission for export markets only. 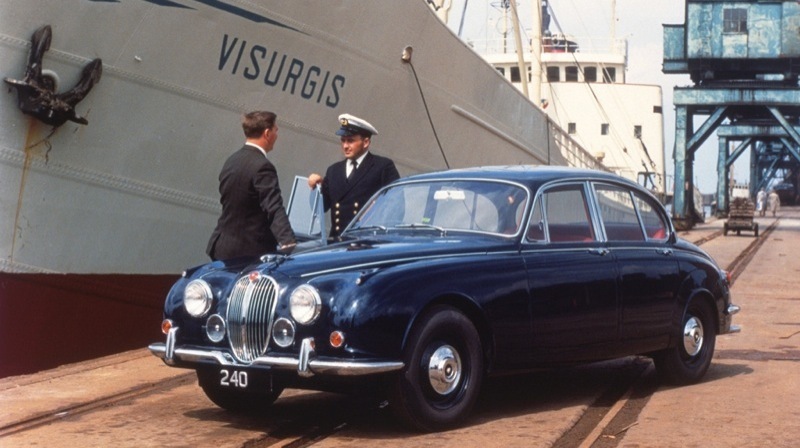 On 26 September 1967 Jaguar announced the 240 and 340 saloons, the last variation of the original Utah design. The main visual difference was the new slimmer front and rear bumpers. Elsewhere, use was made of plastic technology in car manufacturing. Even the some of the wood trim was in fact Ambla plastic along with other cheaper materials such as the carpet. The 3.8-litre was dropped and now only the 2.4 and 3.4-litres were available. 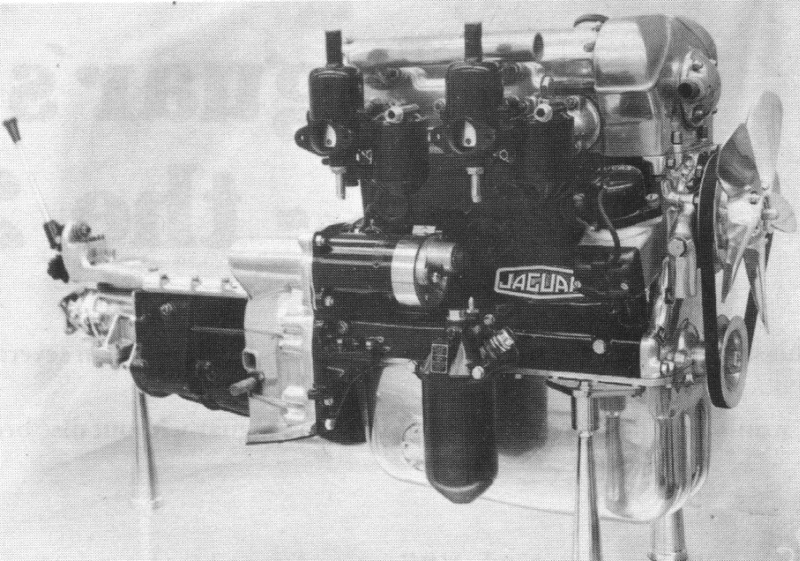 The Solex carburettors of the 2.4-litre engine were replaced by SUs on a new manifold for the 240. This and other revisions pushed peak power up to 133bhp at 5500rpm and torque to 146lb ft at 3700rpm. The revisions to the 2.4-litre engine made Jaguar confident enough to allow the press to road test the 240. Autocar had the first bite of the cherry with a manual overdrive car. This managed a top speed of 106mph, a 0-60mph time of 12.5 seconds and fuel consumption of 18.4mpg. Motor tested a manual non-overdrive car. They managed a top speed of 104.8mph and a 0-60mph time of 11.7 seconds whilst fuel consumption was 17.1mpg. Only two days after the 240 and 340 were revealed came the announcement of the rival Rover P5B, the basic car also being of 1959 vintage, but transformed by the transplant of the ex-GM 3.5-litre V8. Then on 5 October 1967 Jaguar announced the Daimler V8-250, a revised 2.5-litre V8, but without the economy measures inflicted on the 240 and 340. Among the changes were now slim line bumpers and overriders while inside, safety padding over the instrument panel, padded door cappings and ventilated upholstery to improve safety and comfort. Previously optional features now fitted as standard included reclining split-bench front seats, a heated rear window and an alternator replacing the dynamo. In February 1968 the Daimler V8-250 at last became available with manual transmission for UK customers. Motor magazine tested LRW 800F, a manual car with overdrive, enabling a direct comparison with the XK engined manual 240. Motor achieved a top speed of 107.6mph, a 0-60mph time of 11.1 seconds and fuel consumption of 18.1mpg. So despite the revisions to the XK engine, the Edward Turner V8 was still ahead, if only just. The threat posed by Rover and Triumph to Jaguar was to some effect nullified by the formation of British Leyland, announced in January 1968 and coming into effect in May that year. Jaguar could now concentrate on the imminent XJ4 programme without worrying about replacing the compact saloons, which were about to be culled to make way for the new car. The first to go was the S-type in August 1968. 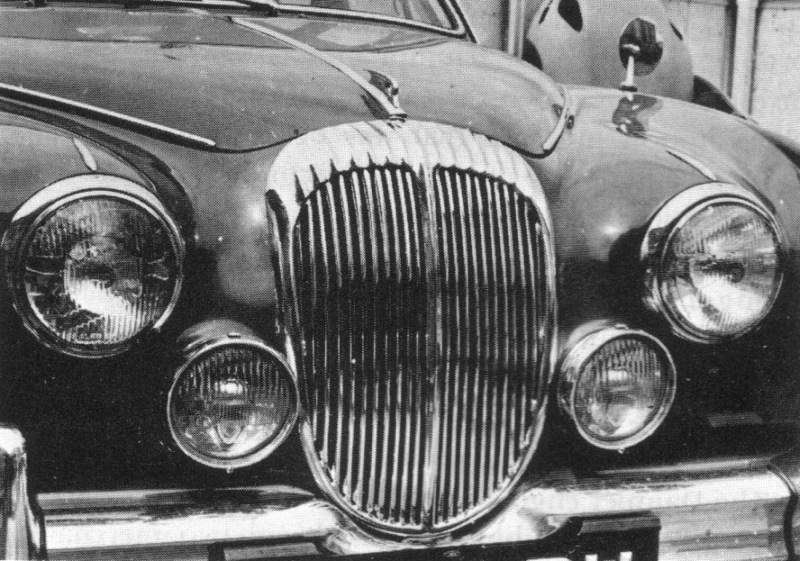 In fact, prior to the merger, when Rover and Triumph were still rivals, Jaguar had briefly investigated a Mk2 replacement using the Daimler 2.5-litre V8. The project was led by Malcolm Sayer and Mike Kimberly, but the programme died with the creation of BLMC. September 1968 arrived and it effectively marked a new era for Jaguar. The Jaguar 420 ceased production on the sixth day of the month. On the 26th the XJ4 was finally launched as the Jaguar XJ6 saloon and the acclaim was instant. The new car was streets ahead in terms of ride, refinement and handling, the culmination of all Jaguar’s quest for automotive perfection. At about the same time production of the 340 saloon ceased as a waiting list built up for the XJ6. By February 1969 Jaguar started its first ever night shift in an effort to meet demand for the new car. In order to free up more space at Browns Lane for yet more XJ6 assembly, the 240 saloon ceased production on 9 April 1969. The Daimler Sovereign ceased production on 9 July 1969, followed by the retirement of Technical director William Heynes on the last day of July 1969. The last Daimler V8-250 emerged on 5 August 1969 and that effectively meant the end of the Utah project after 14 years of production as the future of the Jaguar saloon range lay in the XJ series. The compact saloons were relegated to banger status in the 1970s before becoming perhaps the classic Jaguar in the 1980s. Although it is easy to look at them through rose tinted spectacles, what must be remembered is that from 1964 the market preferred the products of Canley and Solihull. Jaguar Mk1 remains overshadowed by its more visually resolved successor. The photo of the 240 next to the ship VISURGIS looks great and sets the period of to a “tee”. Also the MK1 at the bottom of the pages looks neat too. The pic of the Daimler V8 is indeed the marine version. It was the best pic I could find. The last pic of the MK1 was taken at the Pleasure Boat inn at Hickling, Norfolk, which by co-incidence is near where I live. looking for a MK-2 Daimler Fluted Grille, in perfect condition, no dings, no damage, no pitting. Thanks. 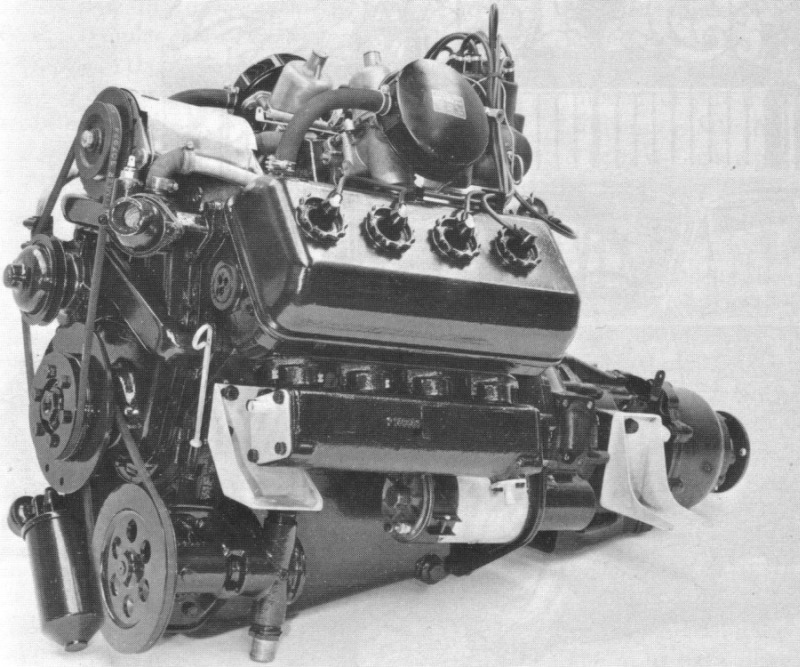 An interesting titbit regarding the Daimler V8 engine is that in 1964 engineer Jack Wicks was working a 4.5-litre V8 diesel engine though its unclear whether it was for either commercial or private car applications. what meaning does the word UTAH have for Jaguar? Seems like they used it for every new model including the 1963-1968 S type.